Have large amounts of unwanted waste become a burden to your business? Do you have a commercial property that needs clearing in order for your enterprise to move forward? Read on to learn how you could benefit from the expertise of Colson Transport commercial property clearance service. If your business’s waste is disposed of in an illegal manner, police and environmental protection services may be able to trace certain items within the dumped garbage back to you. Even in cases where you may have handed over money in good faith for your waste to be disposed of responsibly, if the items can be traced back to your business then it is you who will be ultimately accountable. In 2016 the Government introduced new penalties to crack down on illegally dumped waste, meaning you can now face on the spot fines as well as further prosecution. In order to avoid running the risk of receiving a cruel fine, choose a licensed property clearance company who have built up a reliable reputation for disposing of refuse in a lawful manner. Knowing which items are recyclable, and how and where to recycle them can be a painstaking task. Care and attention is required to ensure waste from property clearances are dealt with in an eco friendly manner. Whichever industry you may work in, helping to sustain our environment is beneficial to all and that’s why Colson Transport are fully licensed waste carriers with the Environmental Agency. This means that when hiring the clearance services of Colson Transport, you can rest assured that your business’s unwanted items will be disposed of in line with Environmental Agency guidelines. 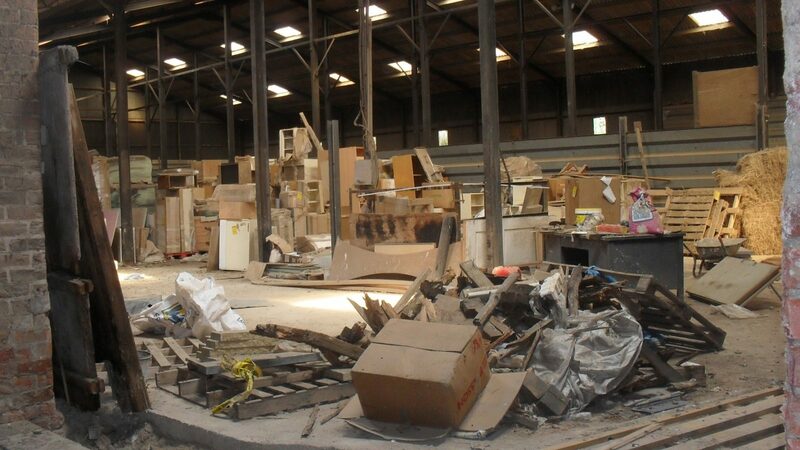 Commercial property clearance can involve dealing with some unpleasant and oftentimes even dangerous sites. UK squatting laws state that it is only illegal to squat in residential buildings; it is therefore not uncommon for obsolete warehouses, factories, offices etc., to have had squatters present at some time. As a result, contents found in buildings left unused for significant periods of time include needles, syringes and other sharp objects that could present serious health hazards if they are attempted to be cleared by anyone without the relevant expertise. If you are considering clearing a similar type of property yourself, it is therefore wise to lean on the side of caution and ask for the help of an experienced property clearance team, who will have the relevant knowhow and equipment to deal with such findings.